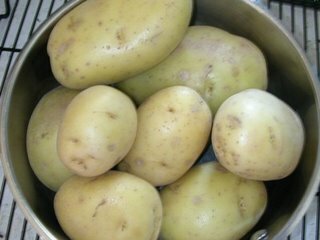 In large saucepan, cover potatoes with water; bring to a boil over high heat. Reduce heat to low and simmer uncovered 10 minutes or until potatoes are tender. Drain and cool slightly, about 2-3 minutes. In large bowl, combine remaining ingredients. Add potatoes and toss to coat. Season with salt and ground black pepper. Chill 1 hour before serving. *the easiest way to "crumble" bacon is to use kitchen shears to cut the bacon into 1 inch chunks before you fry it. I am a firm believer that everything tastes better with bacon. This potato salad is no exception. While it is not something you'd want to eat every day (although, in the past I have subbed plain yogurt for the mayo which might make it a smidge healthier) it is good for picnics and potlucks. I have never been to an event where I've brought this and it wasn't the first thing finished on the table.